Star Indian all-rounder Harmanpreet Kaur has made a jump of seven slots to move to the sixth position in the latest ICC ODI Rankings for Batswoman released on Tuesday. 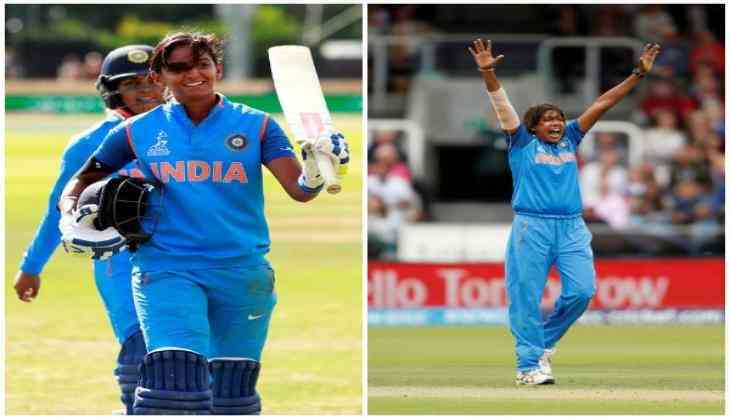 Kaur's swashbuckling 171 not out helped India defeat Australia by 36 runs in the semi-final of the recently concluded ICC Women's World Cup and she followed that with a fighting 51 in the final against England, which India lost by nine runs. She is now the second India batter to feature in the top after Mithali Raj, who is ranked second - 10 points behind Australia captain Meg Lanning. Australia's Ellyse Perry is third, trailing Raj by 12 points. Apart from Kaur, Poonam Raut has gained five slots to reach 14th position after scores of 86 and 14 in the final and semi-final respectively, while Veda Krishnamurthy has gained seven slots to reach a career-best 26th position following scores of 35 in the final and 16 not out in the semi-final. Among bowlers, world's leading ODI wicket-taker Jhulan Goswami has gained four slots to reach second position and within four points of South Africa's Marizanne Kapp after figures of 3 for 23 in the final and two for 35 in the semi-final. Goswami's new-ball partner Shikha Pandey (up one place to 12th) and leg-spinner Poonam (up six places to a career-best 28th) are other India bowlers to move up. In the ICC Women's Team Rankings, which take into account both ODIs and T20Is, there was no change in positions with Australia retaining top spot at 128 points. England has gained one point to reach 125 in second position, while New Zealand and India remain on 118 and 113 points, respectively. The West Indies (105), South Africa (93), Pakistan (73) and Sri Lanka (67) follow.